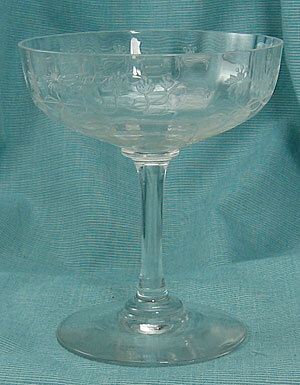 This sherbet or saucer champagne is very good quality glass (excellent tone) and features an intricate, well executed trumpet flower etching. 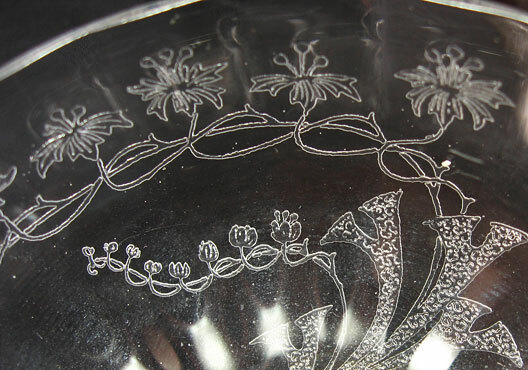 Based on the etching, the most likely maker is Monongah Glass. While these would likely get placed in the Elegant Depression category, they date to the earlier part of the 20th century (pre-Depression). Height is about 4 3/8" with a capacity of about 3 1/2 ounces. Condition: is excellent with no damage and no repairs. Shipping: Will vary based on location or how many you purchase. E-mail us for a quote. (We usually ship via Priority Mail, but we can do Parcel Post if necessary. Mostly, we do things this way because we think it's the right thing to do, but we're also fully aware that a happy customer is more likely to be a repeat customer and tell friends about this great site they found. We even take cash if it's not from a Monopoly set or freshly printed in your basement. Sorry, but we don't take chickens. If you have any questions about payment methods, just get in touch. To buy an item (or more), just e-mail us, or you can call us at 812-467-0191. We'll confirm that the item is still available, make sure we agree on the total, and answer any questions you wish to throw our way. Checks or money orders should be made "Forrest OR Virginia Poston". We also take Paypal (including credit card payments). We try to ship in one or two days after payment arrives, and we're generous with the bubblewrap and styrofoam peanuts. If there's something you'd like us to find for you, let us know. We're just itching to please you, or maybe that was poison ivy we got into. Remember that all proceeds go to support good causes: my spouse, our cats (see the"staff" here), our creditors, my auction addiction, and the plumbing project that never ends. The Wolf at the Door: A Tribute to "Fractured Fairy Tales"